Our snorkling expedition was, eventually, a success. Luke and I rented gear from the dive shop just around the beach from the hotel we were staying at, then surveyed the beach for the best spot to start at. 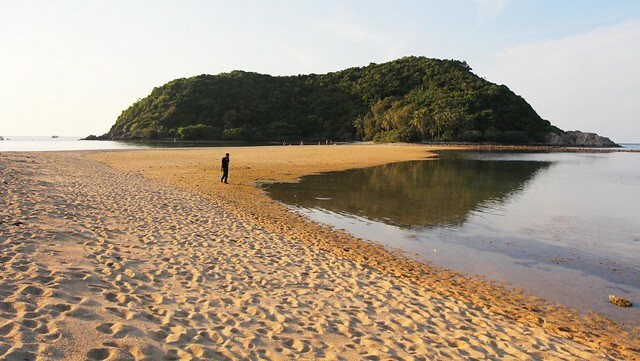 The water at Mae Had is very shallow (knee deep) for about 150 metres out, and there is seaweed and black, rather unappealing, sea cucumbers everywhere. If there is anything more ungainly in this world than me, wearing flippers, trying to walk over slimy rocks while avoiding said cucumbers and spiny things and trying not to put my hands down on anything I didn’t recognise (which was everything)… well, I don’t know what it is. I had a few mini panic attacks when I was trying to swim in 20cms of water and there was no visibility and I had water in my goggles and sand in my flippers, but we eventually made it out to the reef and it was lovely. The visibility was great, there was a good variety of fish and some vivid blue coral that looked like urns with plants growing out of the top. The rest of the coral was mostly brown or grey but the fish made up for it and they swam right up to our faces. I overheard a girl at a bar tell a story about going snorkling and finding a fish in her bikini bottom when she ot out of the water! There were a few diving tour boats around us when we swam. Although it had cost us a fraction of the tour price to get out to the reef I think in future I’d take a tour boat rather than trying to swim out, plus the boats visit a few different areas and it would be nice to see some variety. However, if you’re thinking of doing this yourself I recommend making sure the tour you go on has shade – or take an umbrella. Several of the boats had no shade at all, which for a whole day out seems crazy. That evening we made it down to the beach in time for the sunset. 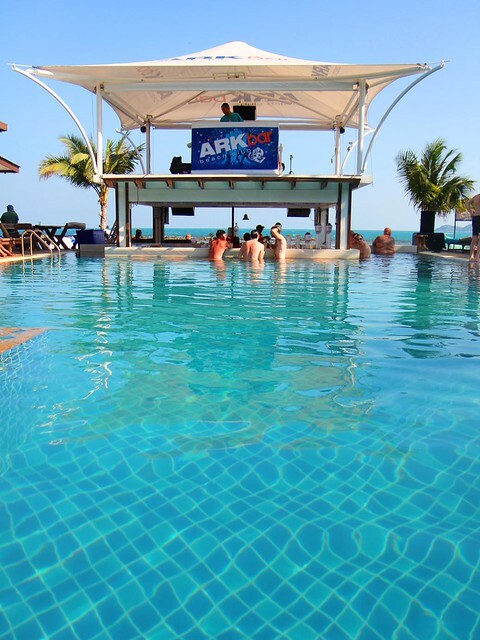 We caught the high speed ferry back to Koh Samui the next day and booked ourselves in at the Ark Bar, which Luke’s parents had told us was a pretty lively spot. All the Trip Adviser reviews said it was noisy but central so we booked 3 nights there, figuring that if we can sleep in the middle of a festival we can deal with anything. Plus we had had enough of quiet resorts. When we arrived it was immediately apparent that Ark Bar is Eurotrash central, but despite that (or perhaps because of it) the buzz of the place was appealing, in a somewhat comedic way. We dumped our bags and headed for the bar. There are 3 small pools, 3 large bars and heaps of tables and chairs in the shade as well as the ubiquitous rows and rows of beach lounges (or, as I’ve come to think of them, ‘melanoma farms’), where scores of overly-muscled men and bikini-clad women of all shapes and sizes wandered around, striking poses and check to see who was watching them. There was a dj on the roof of the swim-up bar playing the kind of bland house music I would expect to hear at the Casino but, since all we’d had for a week was reggae and Thai elevator music, it was a welcome change. The menu at the bar was extensive. There was a page for just about every cuisine you can imagine and this place is clearly a refuge for people who are here to party, not experience Thai culture. You could even get a VB and a pie. We had some food, marveled at the crowd and then, in the evening, we went for a walk down Chaweng Beach Road. Somehow, even though everything is dirty and smelly and draped in power lines and generally looks like no one ever fixes *anything*, Chaweng Beach Road is quite charming. I guess it just looks like what I imagined South East Asia to be. There is a fascinating contrast between the shiny, pristine blue and whiteness of the resort-bordered beach and the almost Bladerunner-esque grittiness of the streets just behind it. Power lines so dense that they provide decent shade! We met up with Luke’s family for dinner and then decided we’d go to a cabaret performance, which turned out to be one of the highlights of the trip so far, and it kills me that I didn’t take my camera. The show was all ladyboys doing drag hits. The venue was not terribly large or impressive but the costumes were great and they performed with enthusiasm while we (or was it just me?) sang along. The best bit, though, was when Luke and Brendan (Luke’s sister’s boyfriend) were dragged up on stage with another fellow and interviewed (“You here with anybody?” “My girlfriend,”(looking at me) “Go home!”) then taken out the back and dressed up in (huge) wigs and sparkly blue dresses and paraded up and down the aisle while the rest of us cried with laughter. It was a great night. If you’re ever in Thailand I highly recommend seeing at least one show, it was enormous fun. For something completely different we’re going to watch some Muay Thai boxing tonight. I wouldn’t have really considered it but Erin, Luke’s sister, said she enjoyed it so I’ll give it a go. With my camera! Lastly, a photo of one of my favourite things about Thailand – the frangipani everywhere. Ha ha ha ha we are all picturing Luke and Brendan swanning around in wigs and sparkles, how entertaining for the rest of you!! I hope SOMEONE took a camera – Lea maybe?? Snorkelling… well sounds like you’re a brave girl Amanda, good for you 🙂 and glad it was a nice reward in the end. No cameras at ALL! Not even a phone! Truly, it is my biggest regret so far and I will not go anywhere without one again;). Eww sea cucumbers and such! I think I would have cried and turned around, well done for making it out to the reef. 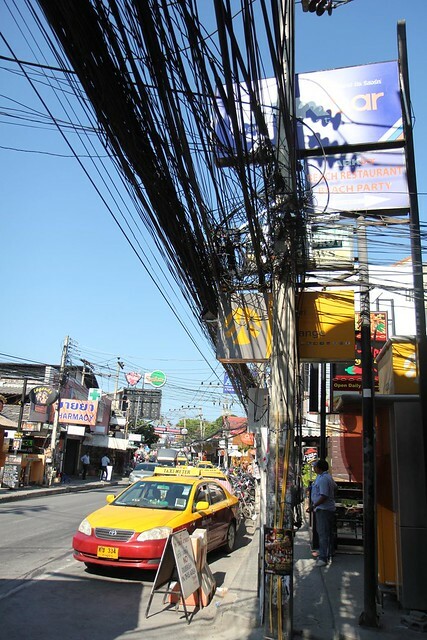 Power lines in sth east Asia are intense! How does it not break all the time? Or perhaps it does? Thank goodness someone understands! I had a feeling everyone would read this and wonder what my problem was;). Yeah, I keep wondering what would happen in a hurricane… how would they ever fix them all? I hope the weather improves in Melbourne! If it helps I’m envious of your lack of humidity;).